Yesterday (Monday) was my last day working on Selah (this time around!) ... and I'm heading home! It's been a great 2 weeks, and we were able to accomplish a lot! As it always seems, the time seems to go by too quickly on these trips, and you leave a good portion of your heart behind ... but something tells me that this won't be the last time I see the train station in Frydlant nad Ostravici! Thanks for following the blog and the encouraging comments ... til next time, na shledanou! Our work continues on Selah with great joy in Eastern Czech Republic. Things are coming together nicely and we're really enjoying every aspect of serving together ... 2 cowboys and a lumberjack ... quite a combination! I'm putting another video on YouTube ... so you can see the latest progress! Simply click on LATEST VIDEO to see what we've been up to! Enjoy! The last 2 days have been filled with opportunities to join our hearts and hands with our friends and co-workers here in Eastern Europe. As I mentioned in the previous blog, on Wednesday we drove to Southern Poland to visit H2O. 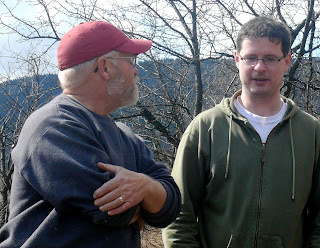 We were very encouraged to see the progress ... and visit with Leszek, Kazik and Susan. The plan is for H2O to open the main part of the facility for groups to use this fall. It's great to hear and see the passion and vision of these faithful and diligent workers who have given their lives to see the youth of Eastern Europe come to know the living God! To be a "Barnabas Team" and encourage these dear friends is a privilege and joy! After our visit to Poland, we returned to help Petr on some projects on his apartment. Along with his many responsibilities, he's been remodeling his "flat" while his American wife and children have been family in the US. Again, encouraging this very talented and committed young man is a significant part of what we do. We know that we cannot do the tasks that he does, but we can come alongside and bring joy and energy to his ministry. Thursday it was back to Selah, where we continued working on building the railing on the deck and trimming windows. Wayne and Dave had to perform a bit of a "high-wire" act to get some of the pre-built frames in place! We should finish the outside trimming today, and get well along on putting together the railing parts. Today (Friday) will be the last day that we see Petr on this trip, as he is going to the States for 3 weeks to be with his family and visit some churches. We'll miss him for sure ... and his absence puts a lot more pressure on Dave's language ability! But, we're hopeful that our friendship and partnership in the gospel will continue to grow in the years to come! There are many more opportunities to serve here, and our hope and prayer is that great results will come, not only from our work, but from the tireless efforts of the many people who serve with Josiah Venture here in Eastern Europe. Stay tuned for at least a couple more updates as we continue the adventure through the weekend! It's been a week since I left the States to come to Czech Republic to help on the Josiah Venture retreat house, Selah. Things have gone well and we're "branching out" to new venues. Tuesday, Mel and Wayne continued with the window framing while I started laying out the railing system. This is kind of tricky business, given the fact that this entire log-constructed building will probably settle 4 - 6 inches! So, we had to scratch our heads a bit and "commiserate" on what would be the best way to proceed. I think we've got a pretty good handle on it, so we should be able to get at least a couple sections together before I leave next week. Working together with the Czech project manager, Petr, is a real joy! We connect on many levels, so its fun to sense a real "kindred spirit." Tuesday morning is the Czech Josiah Venture (KAM) team prayer meeting. Petr invited me to join him and the rest of the group, which was a wonderful privilege! I was able to pray with a few of the guys who I knew from past times together and encourage them in their work. What really struck me was the fact that I can't do what these guys are doing ... but I can certainly encourage and bless them with my prayers and friendship. I look forward to more opportunities to "build God's Kingdom" in this way. Last evening was also very special as far as relationships go. The "tri kamarady" (three comrades) are now staying in the manager's apartment at Hotel Malenovice. It's a nice set-up and we're thankful for three separate beds!!! Supper is even provided, so we were blessed to sit together with Petr and share stories of our growing up and family life. These "connecting points" are super important and really help to encourage and build up one-another. We are blessed to see friendships grow! Today we're heading to Poland with Petr to do a project update on H2O. This is the conference center/camp in southern Poland that Joyce and I worked on last summer. Our March team visited the project when we were here, so it will be very interesting to see the progress. Also, I'm looking forward to greeting my dear friend, Kazik! He's taken a real place in our hearts! 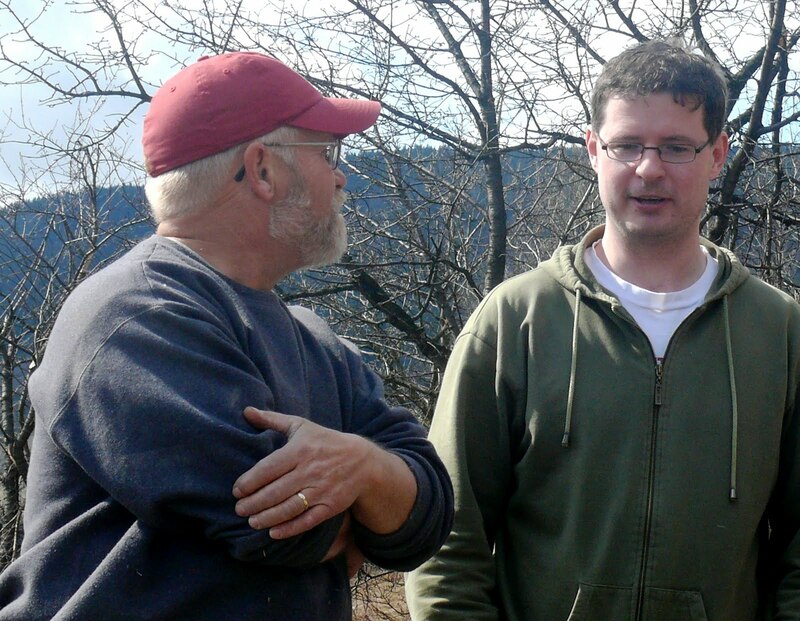 In addition, we will be taking Bratr Orawski, a pastor with whom I worked 17 years ago on a new church building! WOW!! Has it been that long that I've been doing this? Thanks for following the adventure and your encouraging comments! Look for more pics and video tomorrow! After a wonderful relaxing Sunday and a great time with our Czech friends in church, we started out the week with some big goals! We want to try to get all the windows trimmed ... outside and inside! So, as we looked at the weather, it appeared as though we'd have a pretty nice day ... but, as is the case when you're in the mountains, things can change quickly! Even so, we were able to get all but two of the second storey windows trimmed out and ready for the "tin-benders" ... who will install the sill flashing. The day ended by us moving over to Hotel Malenovice where we will be staying until Saturday. Then, who knows where we'll be ... maybe camping at Selah! I'm posting a video on YouTube for you to watch ... so as before ... to watch it simply click on the blue highlighted letters here - Mel, Wayne and Dave working in the rain ... Enjoy! Enjoy the YouTube video update! Click on the highlighted blue letters to view! We've put in 2 good days at Selah and feel like we've gotten off to a great start. As with any "new" project and crew, it takes a little time to start to click, but by noon today the three of us (Mel, Wayne and Dave) feel like there's some good chemistry between us and we know how to proceed forward with the work, together. This morning, we helped our friend, Petr with some projects on his house before heading up to Selah to continue with the window trimming project. Along with window trimming, Mel "put fire" to the final piles of brush that we cut down in March!! There was a lot of brush! While Mel was burning brush, Dave and Wayne were measuring and installing trim on the outside windows. 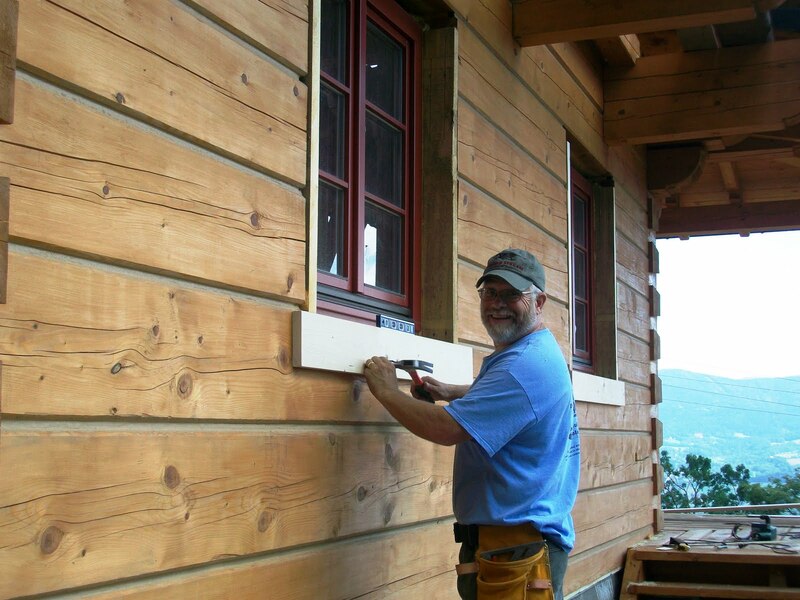 This important step in the process will make the windows ready for the "klempíře" ... the "tin-benders" to install copper sills on the windows on Tuesday. At the end of our day, Petr treated us to supper at a favorite restaurant in the area. This area was famous for its "characters" in its day ... just like many parts of the United States. 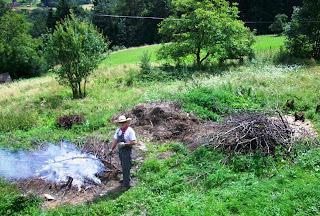 This is the Valašsko region of Moravia, for it's "cowboy-type" characters who were famous for their traditions of sheepherding and unique rural architecture. 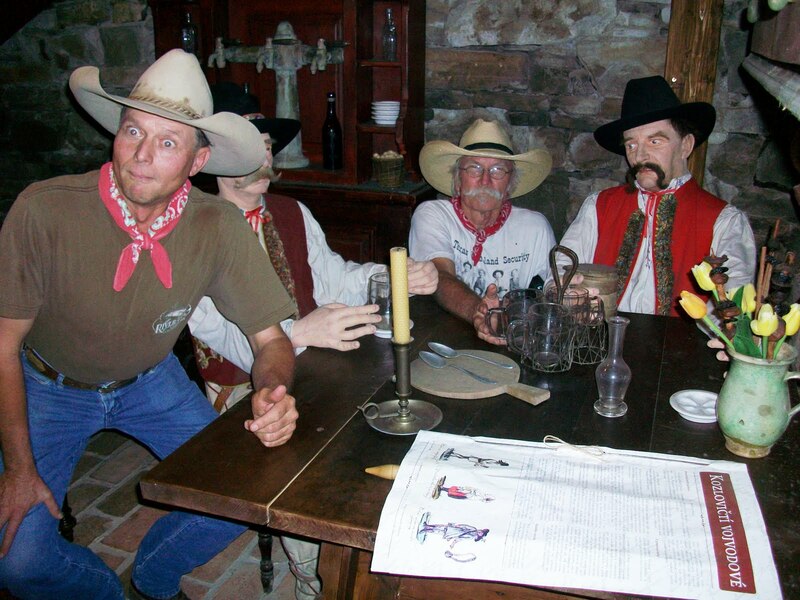 Well, not to be outdone, our own authentic Texas cowboys sat down next to a couple of Valašske cowboys before dinner. We caught them on film engaged in deep cowboy conversation! What a treat! ... not to mention the great food! Tomorrow we're looking forward to being in church with our Czech brothers and sisters and perhaps seeing a bit of the very historical area. Stay tuned for more adventures! I'm safe and sound in Eastern Czech Republic! The trip went well with no glitches at all! Click on the video below to see some of my travel adventures! Petr, Wayne and Mel met me for a great Czech lunch and we spent the rest of Thursday afternoon planning and preparing for the work ahead of us! We're gearing up for some great days of service and friendship! Stay tuned for more updates!! Many times life's journey has some surprising twists and turns. I can honestly say that, even though my family and I have had plenty of those, it still often catches us off guard a little when they come! But, in God's great goodness, He leads us around those curves, even when we don't see what's ahead! Our last blog post related a "Mission Accomplished" story ... and we were greatly pleased to share the results of our time at the Josiah Venture retreat house "Selah" last April. Our team departed that beautiful setting with a feeling of accomplishment ... but also with a knowledge that there was still a lot of work to be done. Our hope (along with Josiah Venture leadership) was to have Selah up and running by July 1. Unfortunately, because of many circumstances, that goal was unable to be reached. But, we all believe that God can be trusted, and that He isn't up in heaven wringing His hands wondering what He's gonna do now???!!! As we 've moved around this summer, we've made a point to keep in close touch with the leaders of Josiah Venture (www.josiahventure.com) regarding the status of Selah. Last week we were on an international call with Mel, one of JV's Executive Directors. As my wife and I were talking with Mel, we had a "Macedonian call" experience (Acts 16: 6-12). As he explained the need for carpenters to give the final push to complete Selah by September 1, Joyce and I agreed that I should go. So, despite "other plans" ... this unexpected turn of events has me leaving for Czech Republic tomorrow, August 11, to work for 2 weeks on the Josiah Venture retreat house ... Selah!! Completion of this facility is a critical component for the Josiah Venture organization to offer rest and refreshment to their 100+ staff members. 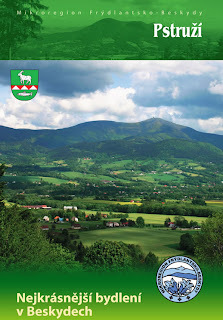 It's situated in one of the most beautiful parts of Czech Republic: the Beskydy Mountains of Eastern Moravia. 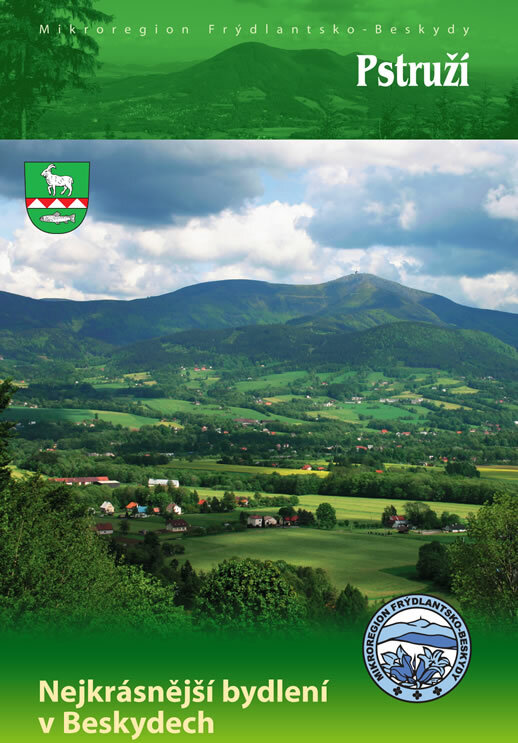 In fact, the brochure cover to the right proclaims this area as the "most beautiful living in the Beskydy Mountains! Not a bad place to spend a couple weeks working! Our desire is that God will use this facility to touch the hearts and minds of many, who will in turn, be able to reach out with the love of God to those who are far from Him! I love the fact that Jesus, the Master Builder, is building His church!! ... and am blessed to be used by Him! I won't be working alone on this project as I've heard that Mel's dad, Mel Sr. ... and another fellow, Wayne, will be joining me! That makes me super excited. 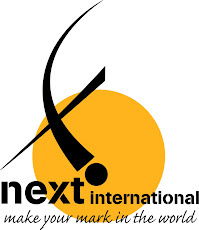 Our work will be done under the very capable direction of project manager Petr, who is a JV staffer and good friend! I'm getting very excited to meet him on Thursday afternoon and see what work he has in mind for us! Please come back often and see what we're up to and make comments! I'm even hoping to post videos (for the first time!) on the blog! Thank you in advance for your thoughts and prayers. We sense God's leading us very clearly in this latest "call!"